ISIS has released Issue 3 of Rumiyah Magazine, in English. (no link due to not wanting to promote its readership). It begins with a transcript of IS leader al Baghadi's recent speech. Then there is an article called "Just Terror Tactics" that praises the use of vehicle attacks, particularly with large trucks like those you can rent from Hertz and U-Haul. 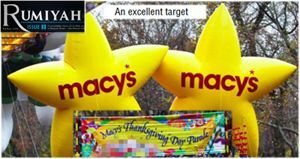 It has a two big photos of the Macy's Thanksgiving Day Parade and states it is an "excellent target." The U.S. raided an Islamic State prison in Iraq to free hostages. Most of those jailed were locals, some are said to be ISIS members suspected of being spies. About 20 of them were Iraqi security forces. One U.S. Special Forces member was killed. The raid was led by Kurdish Peshmerga fighters. 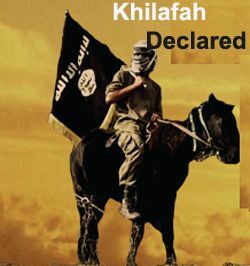 The Islamic State formerly known as ISIS has released a new issue of its glossy photo-magazine, titled "The Return of the Khilafah." You can download the English version here.